tags: Martin Luther King, nuclear disarmament, holidays, Jr.
William Lambers is the author of The Road to Peace and Ending World Hunger. His writing has been published by History News Network, NY Times, The Hill, Newsweek, Baltimore Sun and many other news outlets. The year was 1958. The Soviet Union and the United States were developing and testing nukes at an alarming rate. 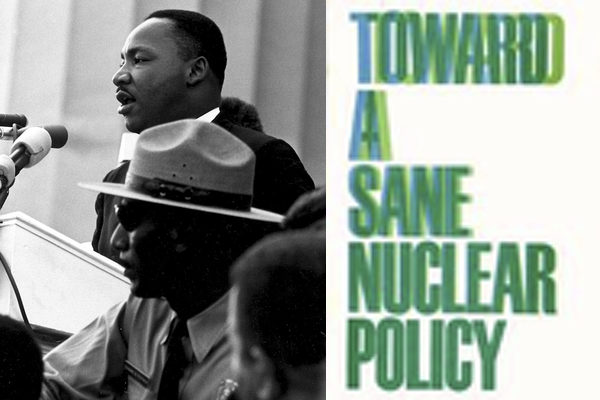 In March, Dr. Martin Luther King, Jr. received a letter from Norman Cousins and Clarence Pickett of the National Committee for a Sane Nuclear Policy (SANE). King was asked to support a statement urging an end to nuclear testing. King joined the SANE movement right away. That April, Dr. King also signed an appeal by Protestant clergyman on halting nuke tests. Few people know Dr. King was also an activist for nuclear disarmament and urged peace during the Cold War nuclear arms race. He can inspire us today to finish the journey of eliminating all nuclear weapons. The public outcry generated by groups like SANE against nuclear tests helped encourage President Dwight Eisenhower to start negotiations with the Soviets on a test ban treaty in 1958. In October, King joined a statement to the U.S. and Soviet negotiators in Geneva. Eisenhower proposed a suspension of nuclear tests during the talks. There were no nuclear tests by the U.S. or the Soviets from late 1958 into 1961. His successor President John F. Kennedy was able to produce a limited treaty with the Soviets in 1963 banning nuclear tests in the atmosphere, underwater and outer space. Underground tests were permitted to continue. Like many others, King believed ending nuclear testing was a critical step toward stopping the arms race. In 1957, in Ebony Magazine, King wrote "I definitely feel that the development and use of nuclear weapons of war should be banned. It cannot be disputed that a full scale nuclear war would be utterly catastrophic. Hundreds and millions of people would be killed outright by the blast and heat, and by the ionizing radiation produced at the instant of the explosion." The goal of eliminating nuclear weapons has been shared by successive leaders including presidents Ronald Reagan and Barack Obama. Today, however, we have lost any momentum in reducing the nuclear danger. There are still close to 15,000 nukes worldwide according to the Arms Control Association. President Trump has yet to take action on eliminating nuclear weapons. Instead Trump has sought to scrap the Iran nuclear deal and the INF Treaty with Russia. Dr. King’s words can inspire us to jumpstart nuclear disarmament. King wanted all people, all nations, to come together to work out their differences. Through what Dr. King called “a great fellowship of love” the world can achieve peace and nuclear disarmament. The 1996 Comprehensive Nuclear Test Ban Treaty, banning all tests including underground, has yet to be ratified by the U.S. Senate. President Trump could ask the Senate to ratify this treaty and fulfill one of Dr. King’s goals of ending nuke tests forever. Instead of nation’s wasting dollars on nukes we could feed the hungry, end disease, and save the environment. As we celebrate Martin Luther King Day listen to his words and be inspired to take action for world peace.